"Where did you get those big brown eyes?" 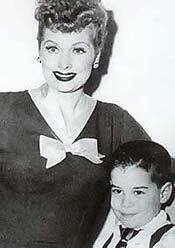 asked Lucille Ball stooping down to a then four-year-old Gregg Oppenheimer whose father, Jess, was creator, producer, and head writer of I Love Lucy. "They came with the face," replied Gregg. Lucy nearly fell over with laughter. 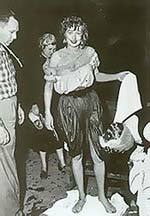 That was Gregg's introduction to Lucy, which took place on the I Love Lucy set, episode #139: "Staten Island Ferry." Oppenheimer has been a fan ever since. An avid collector, the library in his Santa Monica home is filled with Lucy memorabilia along with a 1937 console Philco radio and an array of vintage photographs signed by Fred Astaire, Fanny Brice, and Fred Allen. As he sits in a wingback paisley-patterned chair, he reflects. 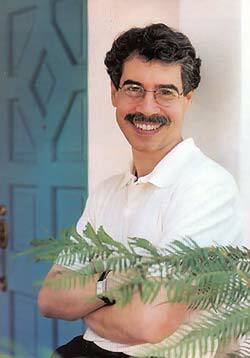 "I was introduced to the AIDS epidemic by reading Elizabeth Glaser's incredibly moving book, In the Absence of Angels. And reading it brought back memories of the problems my wife, Debbie, and I had with my daughter, Julie. She was born with a malrotated colon that was not diagnosed until she was a year old. So from the time she was six months old she was in and out of the hospital. She underwent all kinds of tests and got sicker and sicker. We watched helplessly as she grew more and more seriously ill, while all the specialists we consulted were unable to pinpoint her problem, despite every conceivable test and the constant, painful taking of blood samples. I mean, I was taking her to the UCLA emergency room on Christmas day! One time, the doctor didn't have the vial he needed while he was drawing Julie's blood. Since there was no nurse around, he gave it to me to hold while he got the vial. Here I was drawing my baby's blood, and it was just a devastating experience. So when I read Glaser's book it just all came back to me. How devastating this epidemic must be for parents whose children are afflicted with AIDS and what they must be going through," he says sullenly, adding that Julie is now a healthy fourteen-year-old. "Too many parents of HIV-positive children haven't been as lucky as we were." Gregg and his wife felt so compelled to act on the AIDS crisis that in 1997 they donated a cast-signed I Love Lucy script to the annual "Loving Lucy" convention. Julie even pitched in and anchored the Oppenheimer booth. The script was auctioned off for over $6,000 and proceeds went to the Elizabeth Glaser Pediatric AIDS Foundation. Oppenheimer wasn't completely satisfied, so in 1998 he decided to do a live on-stage recreation of Lucille Ball's 1948 radio sitcom, My Favorite Husband (on which I Love Lucy was based) called "Lucy's First Sitcom: A 50th Anniversary Reunion." "My dream has always been to go in a time machine back to the forties and fifties because I just love that Hollywood era." says Gregg. "So I did the next best thing. 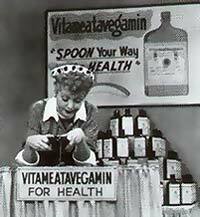 I gathered together all the surviving cast members of I Love Lucy and produced and directed this production." Veterans who participated included Doris Singleton (Carolyn Appleby), Shirley Mitchell (Marion Strong), and Roz and Marilyn Borden (Teensy and Weensy). The Elizabeth Glaser Pediatric AIDS Foundation reaped the benefits that night with nearly $50,000 in proceeds. 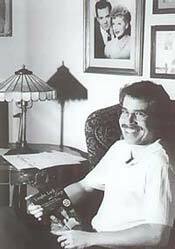 Since then, Gregg has created a Web site—Lucylibrary.com—where all net proceeds go to the Foundation—Amazon.com pays a five to fifteen percent referral fee on all Amazon.com purchases referred from the site, and Cathy's Closet pays a fifteen percent referral fee on all Lucy dolls and other merchandise purchased at the site. "Lucie [Arnaz, Lucy and Desi's daughter] was thrilled to have the foundation receiving funds from the site, especially since she is heavily involved in the AIDS crisis, and she's a supporter of theirs as well. After Lucille Ball died, the Elizabeth Glaser Pediatric AIDS Foundation was among the charities selected by Lucie to receive some of the proceeds of her mother's estate." Gregg's objective in creating this Web site was to have a place where people could go to obtain accurate, authoritative information since there are thousands of Lucy and Desi fan Web sites that exist which are so misinformed. "We had been trying to get a Web site together forever," says Lucie Arnaz from London, where she's starring in a musical adaptation of The Witches of Eastwick. "But somehow we could never find the people who could do it the way we wanted and whom we could take a whack at it and he did a terrific job. It has been extremely useful. It is primarily a site to visit if you want to purchase something in a book or a video having to do with Lucille Ball or I Love Lucy. But still, it is better than anything that's up so far." Oppenheimer also sells posters left over from the 1998 benefit for a $15 donation (unsigned) and a $35 donation (signed). And the Elizabeth Glaser Pediatric AIDS Foundation also receives $3 from each Internet sale of his book, Laughs, Luck...and Lucy. Laughs, Luck...and Lucy was a father-son collaboration. Gregg's father, Jess, began writing his memoirs and focused on How I Came to Create the Most Popular Sitcom of All Time (the subtitle of the book). He died in 1988 before the project was completed. Several years prior, Jess had asked Gregg to edit it, which Gregg did. Gregg notes: "I loved it! Being a lawyer, I marked the hell out of it. And dad gave me the greatest compliment anybody ever gave me. He said, 'You're a hell of an editor.' Then he made the changes, and put it aside." Gregg completely forgot about the manuscript until a while after Jess's death, when he found it buried in his father's desk. "I reread it and knew I had to do something with it," he says. But there wasn't enough material. Digging through senior's archives, Gregg found a three-hour tape of a 1961 interview someone had conducted with Jess about his life. This was the fodder Gregg needed to complete the book. And so, Oppenheimer, a practicing lawyer for eighteen years, took a year's sabbatical, and dove in. Finishing the book was not only therapeutic, but also a cathartic experience for Gregg, especially since his father's death left him shattered. "Actually, I got even closer to him through that because I had to step into his shoes. I wrote it in his voice, which may seem odd, but all the stories that he told me, I heard them in his voice. Writing this book allowed me to get past the grief because I was really obsessing on it. I really needed to do this, and I also did it for the family, especially for my daughter becasue she was only two when he died. By reading the book you feel like you've gotten to know Dad." When the year was up, Oppenheimer realized that writing was much more fulfilling than law. "I decided I'd rather make people laugh than make them pay," Gregg says with a giggle. He did however return to practicing law for awhile but only until a publisher bit. In 1996, Laughs, Luck...and Lucy was published, and in 1998 the book won "Best Pop Culture Audiobook" from Publisher's Weekly for the audiocassette edition. Lucie Arnaz adds: "Gregg's book that he finished from his father's materials is a wonderful and informative read and a real treasure to any Lucy lover. It's a must-read for anyone studying the history of the sitcom and especially of I Love Lucy. It's sensible, straightforward, and funny, just like its authors." Oppenheimer is currently working on a book of original I Love Lucy scripts to comemorate the show's fiftieth anniversay in 2001. And when writer's block hits him, he helps to prepare Glatt Kosher meals for HIV and AIDS patients at Project Chicken Soup. Leaving Oppenheimer's palm tree-lined neighborhood, one can almost see the Ricardos and Mertzes huddle wide-eyed in their 1955 Cadillac convertible, having just arrived from New York on their cross-country journey and heading for the Beverly Palms Hotel to begin their West Coast exploits. According to Oppenheimer, at any given moment, someone somewhere on earth is watching I Love Lucy. So with that and Gregg's dedication, the Lucy adventures will continue. The character names for Lucy and Desi were originally "Lucy and Larry Lopez." "When Lucille Ball stepped out of the Lucy Ricardo character, she was a very different person. She was playing a little girl in a grown woman's body. She put her voice up a pitch; it was higher. And it was all sort of sweetness and light. She wasn't at all like that off stage. She was a hard-nosed business woman." "Lucy had great instincts knowing that there was something wrong but she wouldn't be able to put her finger on what it was. Vivian [Vance] could always pinpoint exactly what the problem was." "The secret of Lucy was that she was a phenomenal dramatic actress playing a comic role. She wasn't a naturally funny person, but a wonderful actress playing Lucy Ricardo and that was the role she was born to play." "Desi and Lucy were totally different kinds of performers. Lucy would be the worst at the first reading. She had to make the part her own, internalize it, and then as the week went on she got better and better. She wanted to rehearse as much as possible. Desi was the opposite. He would immediately pick up on the character, do a good first reading, and it wouldn't change throughout rehearsal, at least the rehearsals he attended. Desi was so busy running Desilu Productions that director Bill Asher (later Elizabeth Montgomery's husband) would stand in for him. Desi would start to leave the set and Lucy would say, 'Where are you going? We need rehearsals.' He would answer, 'What are you talking about? We know the lines.'" I love Lucy was the first TV show to use an "in the lens" teleprompter, which was invented by Jess Oppenheimer. I Love Lucy was the first TV show to be filmed by three moving cameras, and that system is still used today. 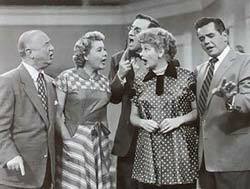 I Love Lucy was performed as live theater—no stops, no retakes, no laugh tracks. "Nobody dared flub a line because they knew they would never work at Desilu again. Lucy was very demanding that way. If you wanted to go on I Love Lucy, you better know your stuff." In the last I Love Lucy episode, #179 titled "The Recardos Dedicate a Statue," it has been previously reported that Lucie and Desi, Jr., were both part of the crowd scene. Not true. It was only Desi, Jr. The most influential and imitated sitcom in television history, I Love Lucy never won an Emmy Award for writing.